With the first snows already hitting New England, it’s time to get ready for the cold weather and the resulting freezes that cause ice issues. Preparing your home is more than just stocking up on firewood and salt for the driveway, it’s also about making sure your home is both protected from the cold and that you have the tools to remove any hazards before they further damage your home. 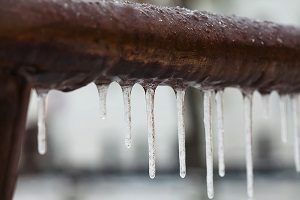 This article will go over two major ice issues that spring up in the winter: frozen pipes and ice dams. Evacuation: Before the first freeze, make sure to empty unused pipes of water. For example, for irrigation systems such as sprinklers, get them blown out or drained. Insulation: When possible, insulate your pipes and water fixtures. This can include covering outdoor faucets and wrapping pipes in uninsulated parts of your home. Warming: You can also leave pipes running overnight with a slight trickle of water (around 55 degrees Fahrenheit) to keep them from freezing. If you do encounter a frozen pipe: do not panic. This is often found when water is stopped in the pipe. Search for either a dripping or ice-covered pipe and listen for a hollow sound. You can use a hair dryer or pick up heat tape from your local hardware store. If the pipe has burst, make sure to shut off the water before starting repairs. Ice dams are a huge – and costly – headache for any homeowner. They are caused by two things: the heat of your roof, and the freezing temperatures. As snow and ice melt on your roof (which is above freezing due to heat loss from the room below), it runs down to the edge of your roof. At the edge of your roof, which is freezing since there is no room below it, the water re-freezes, forming an ice dam from the water behind it. That water is pushed back and down, which can cause it to push through your roof and into your home, resulting in massive water damage. Maintenance: Make sure to keep your gutter clear of debris, as their clogging is usually a prelude to ice dams. When it does snow, think about getting a snow rake and removing it. Insulation: Insulate your attic from the rest of your home and open the vents. This will allow it to get down to freezing along with the roof, which means the snow and ice won’t melt. Treatment: Already have an ice dam? Deal with it sooner than later. Check out the further reading below for multiple solutions to dealing with them yourself. When it comes to dealing with damage to your home this winter, you’re not alone. The TJ Woods Insurance Agency is here to help provide you with the peace of mind of homeowners insurance, as well as to quickly help you file any claims you need to. Contact us today to get started.